2 Gold medals - Martial Arts Tournament, Nepal. Martial arts is a sport that is not entirely dependent on fighting. It is a way to boost morale and build character. Chelsea Fernandes will vouch for that. The 15-year-old takes things as they come. She punches when she has to and kicks when she is needed to. 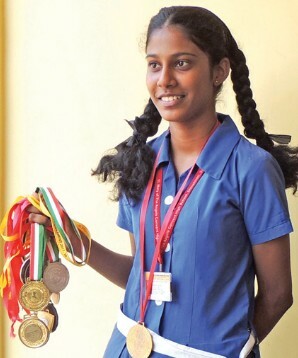 Chelsea is a student at the St. Mary of Angels Convent High School in Goa. She harbored a growing love for the sport and by defying all odds, she developed an interest in martial arts and went ahead to pursue it just the same. Daughter of Carmo and Molly Fernandes, she resides in Chinchinim, in the south district of Goa. At a very young age, she got into SQAY Martial Arts and ever since has been steadily rising upwards in the league. SQAY is a form of sword-fighting that originally originated from Kashmir. The sport has armed and unarmed techniques. Armed SQAY makes used of curved single-edged sword paired with a shield. One can also use a sword in either hand. On the other end, within unarmed techniques falls kicks, punches, locks, and chops. Chelsea has won several medals at the national level for three consecutive years. Gold in the sub-junior competition 2015-2016 that was held in Solapur, Maharashtra in the U-47 Kg. A silver in the K-1 in 2016-2017 Harayana. She also secured a bronze medal in the U-56 Kg in 2017-2018 event that was held in Goa. Her next glorious victory came in Kathmandu, Nepal where she brought home two gold medals in Mix K-1 and in Loba (fighting) in the minus 54 Kg category. Despite having scored medals and brought pride to her family and her country, Chelsea recounts that the journey has been a road full of bumps. The ride hasn’t been easy and she has had to undergo numerous difficulties to get where she is now. Martial arts is an artful sport. It does not get easier. You just have to get better. It’s like a mountain. Once you have climbed up to the top, you realize there is yet another summit for you to conquer. For Chelsea, the beginning was rough. She didn’t see immediate success but she worked her way up to the top. She had faith in herself and she had the courage to take the first step. She did fear for her chances but what is life if there are no fears to conquer? At some point, in your life, you have to stand up for yourself and do the needful. Chelsea’s advice to the youth that wants to get into Martial Arts is to not harbor doubts about themselves and just go for it. Martial Arts can come in handy. It is a method of self-defense and in this world where you don’t know where the next punch may come from, it is necessary to be aware and alert. Being physically fit will go a long way in helping you stand up for yourself.